From the Farmer’s Market which opened yesterday. It seemed like it took forever to spin this batt. It was a different preparation than I have ever tried. 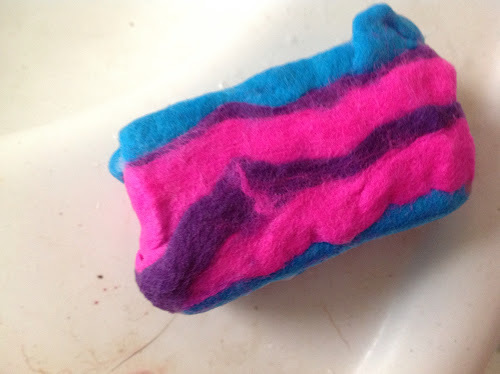 I am not sure how she makes these, but the end result is a center pull batt that needs no pre-drafting. It was very pleasurable to spin. 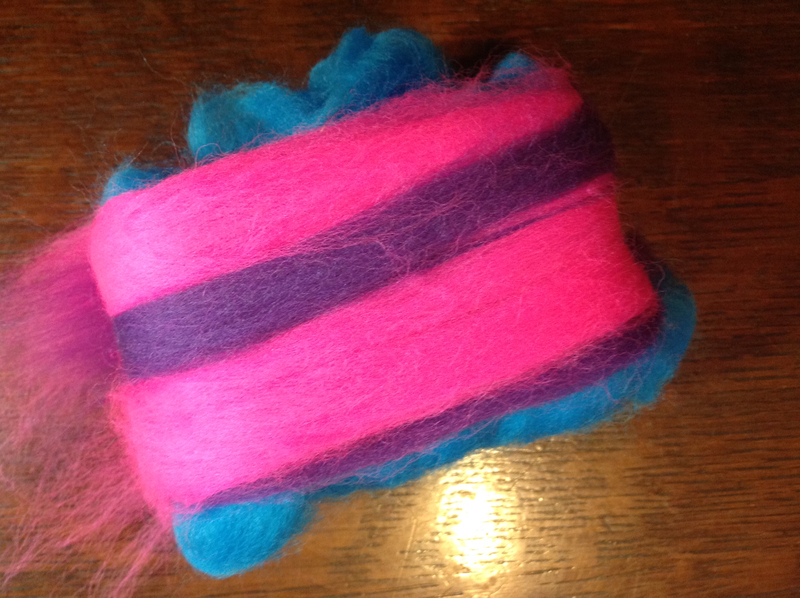 When I wound it off the bobbin I had over 1,000 yards of single ply. 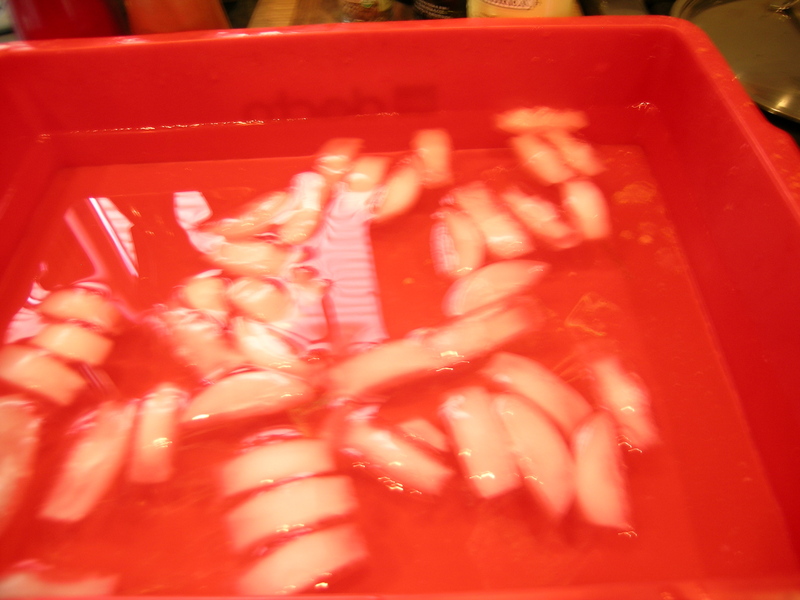 Then a pot of ice water, and repeating this with agitation until it has just fulled but not felted into a big blob. Then lots of thwacking. I almost had a big blob. 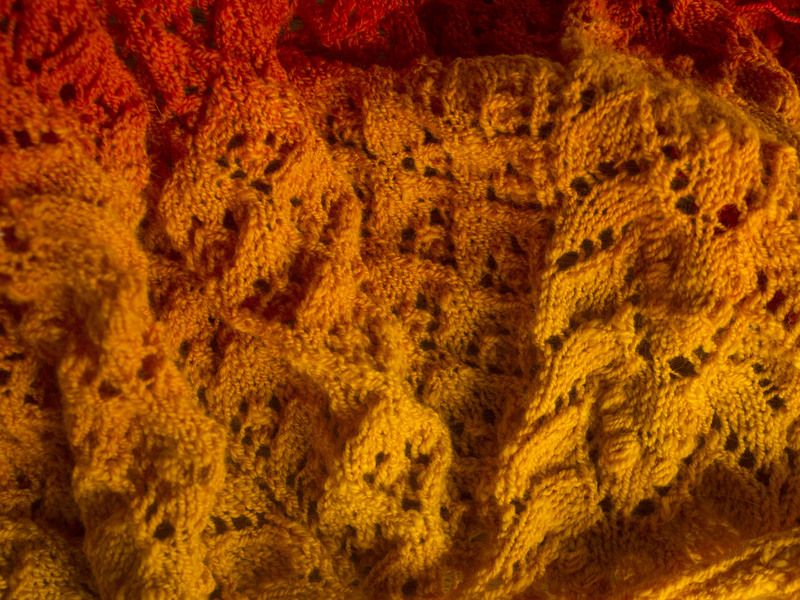 I was a bit distressed, mostly at the time that I would have lost, and instead of photographing the process, then spent my time trying to make sure that the fibers did not permanently felt to one another by stretching it out, pulling the fibers away from one another, and ultimately letting it dry stretched out on my swift. Then, through lots of pre-recorded shows on the DVR, winding it into a ball and unweaving any messes that I created. 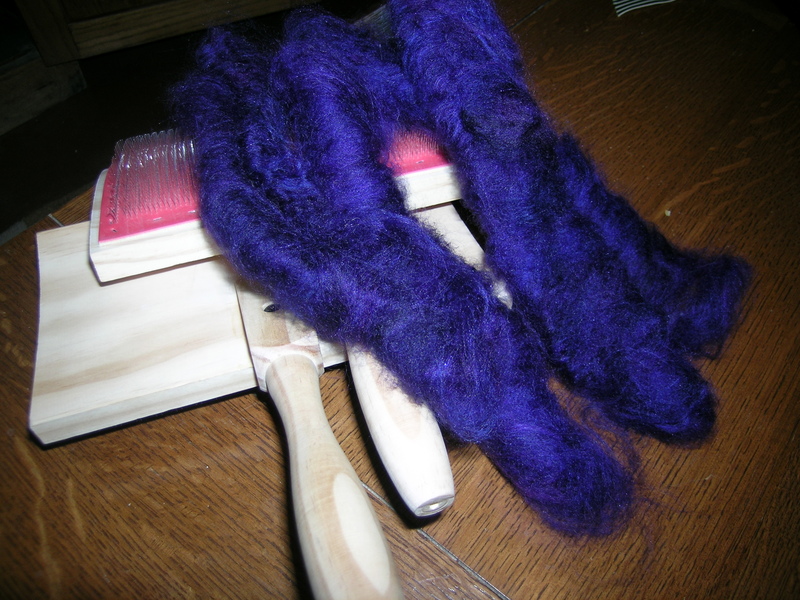 Then I wound it onto my skein winder and was good to go. Pre-fulling I had over 1,000 yards. 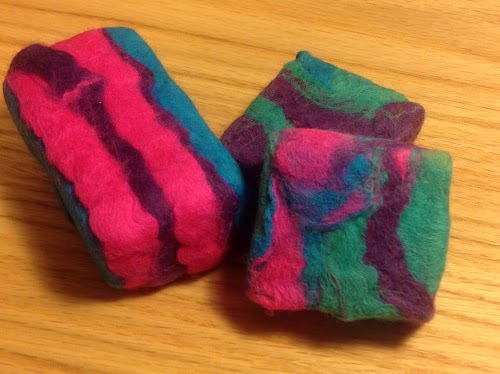 I am not sure how much the felting process took away from my yardage. Plying may be more in my future than fulling, as this was a stressful process. I recommend trying it on a much smaller scale the first time! 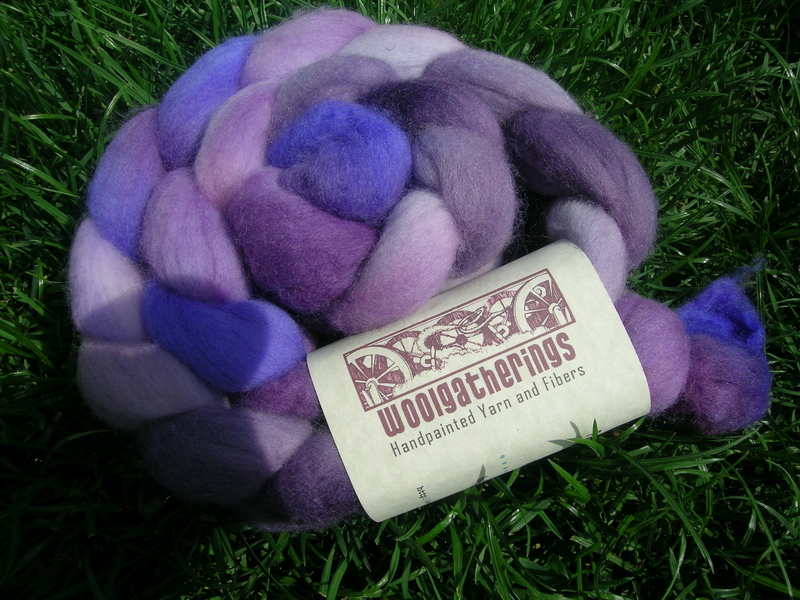 Wow – I’ve been spinning a long time … and thought I’d tried everything … I’ve never heard of pre-fulling before and I now will have to try it. Thanks for an interesting post. You are welcome! My recommendation would be to try it on a much smaller scale first. This is the second post on The Fiber Event at Greencastle. 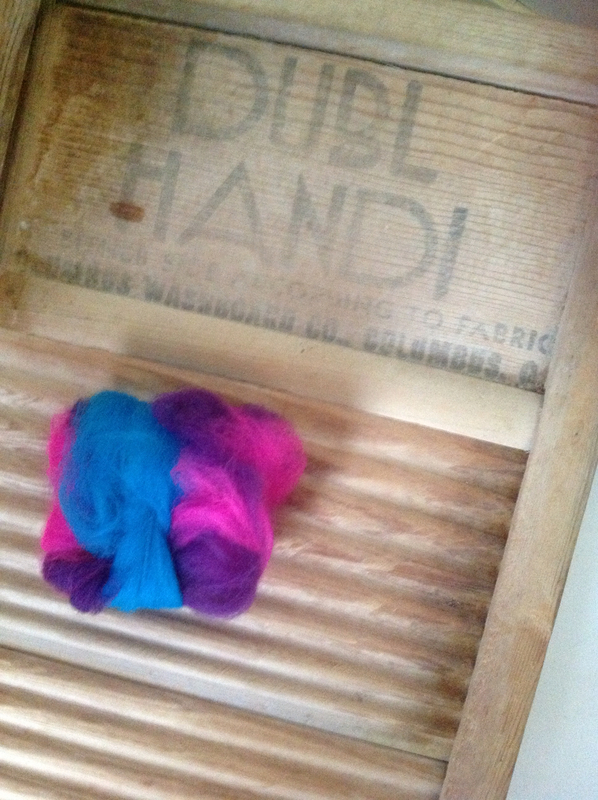 Not only did we find some great fiber, but we met some really interesting people also. Our favorite by far was Gee Gee, a 72-year-old who sewed the most amazing aprons on her 1918 Singer. 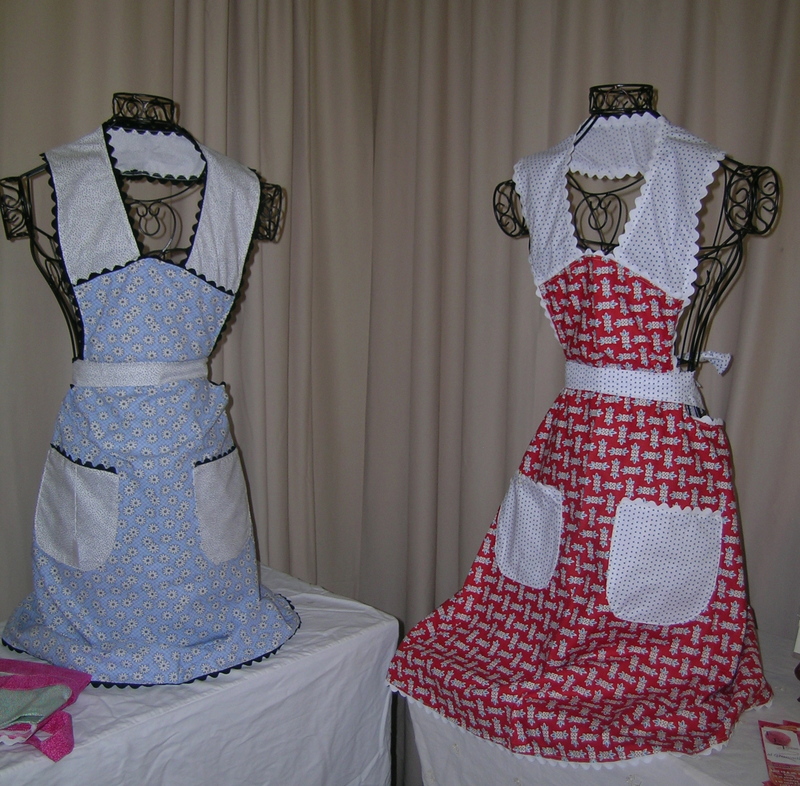 She had aprons from period patterns, and the story behind each style and why they were making them at a period in time. These are from the 30’s when women were concerned about conserving fabric, and would use smaller scrap pieces for the pockets, or neck-band, and not a lot wasted in flaring out or gathering of fabrics. The blue one was purchased on my second visit as a gift. Gee Gee was just so cute that I had to get a picture of her with Andi. She was very flattered. She is a hoot, saving her money to buy a computer so that she can research the history of aprons and also read some of her favorite books. We went back twice, and I got this early 40’s bib apron for myself, the gathering indicates that there was more money available, and they were able to use extra fabrics. 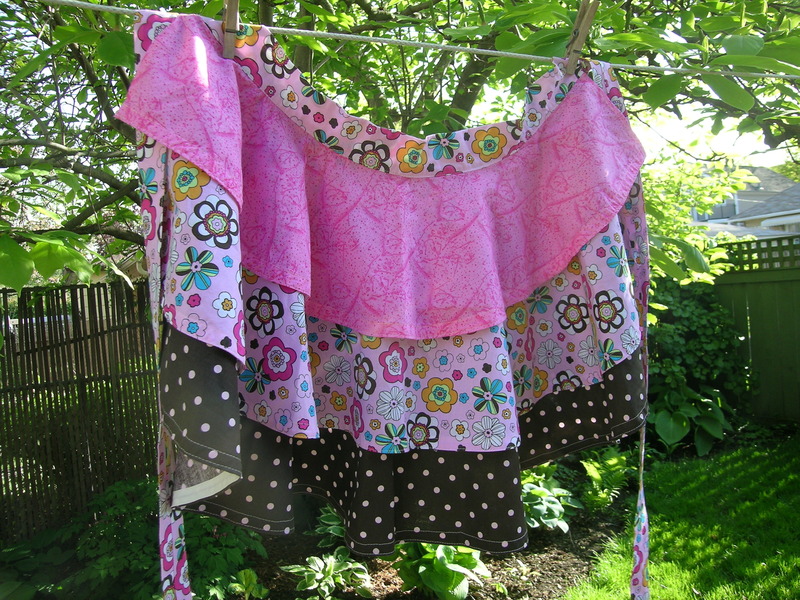 I also got myself this 1/2 apron, a 1950’s “Party Apron” design that uses full 1/2 circles of fabric to create wonderful drape. I want to have a dinner party just to be able to wear it. Just before we left we met this wonderful couple who are reenactors at a historic village in Indiana and were there demonstrating spinning Flax. 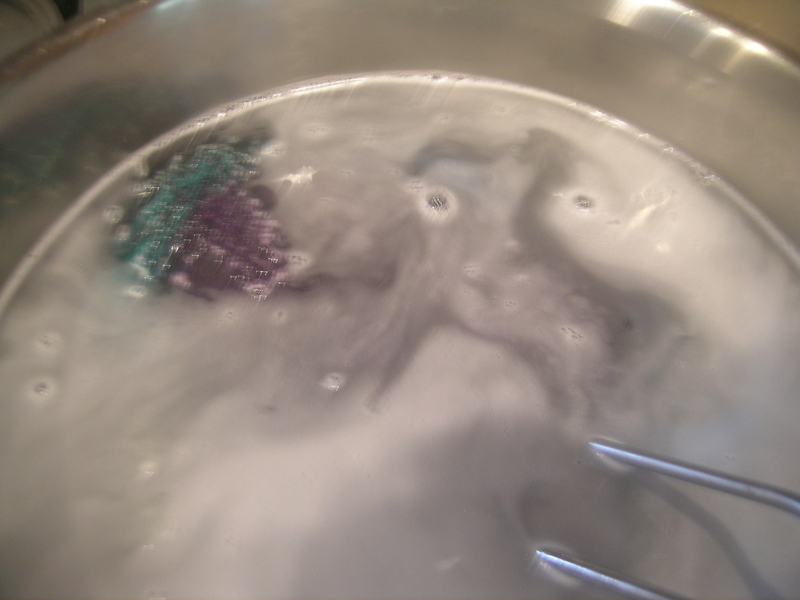 The first process is Retting, which is essentially soaking the fiber for a period of time. 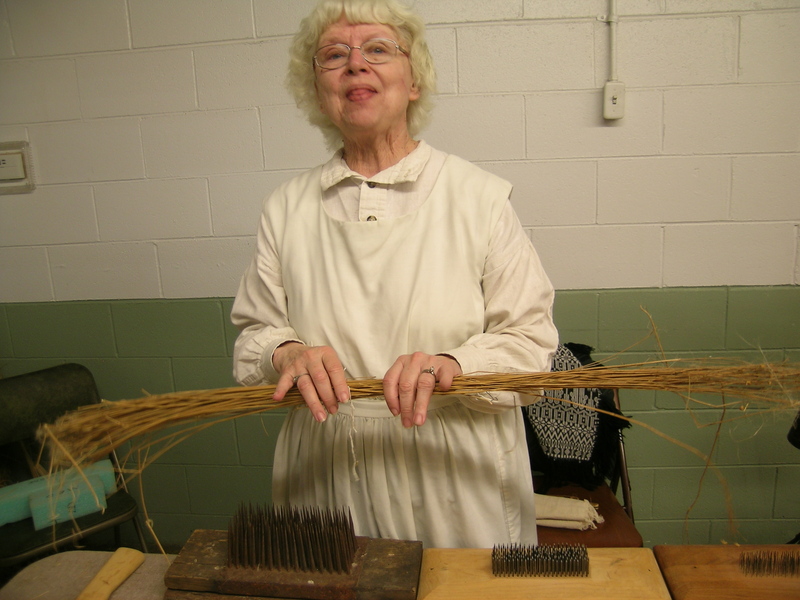 Heckling: In this process the fiber is pulled through various different sized heckling combs or heckles. A heckle is a bed of “nails” – sharp, long-tapered, tempered, polished steel pins driven into wooden blocks at regular spacing. 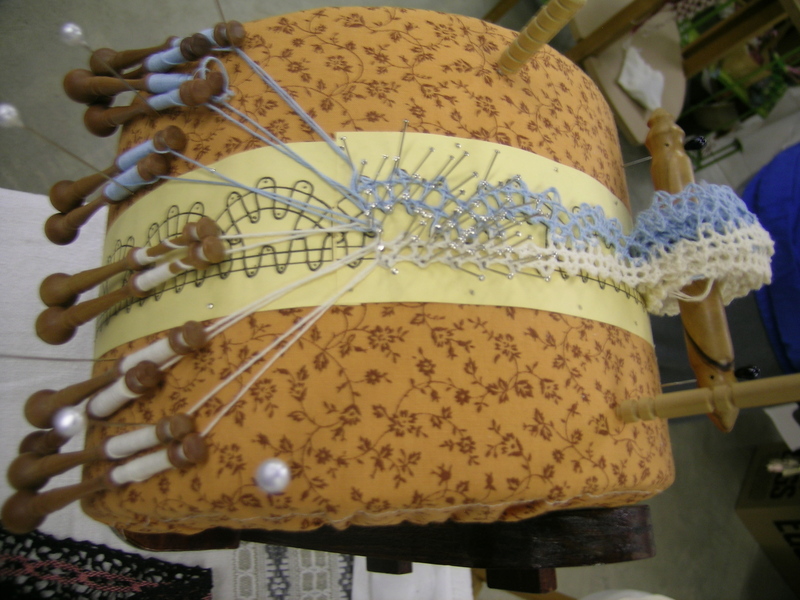 A good progression is from 4 pins per square inch, to 12, to 25 to 48 to 80. 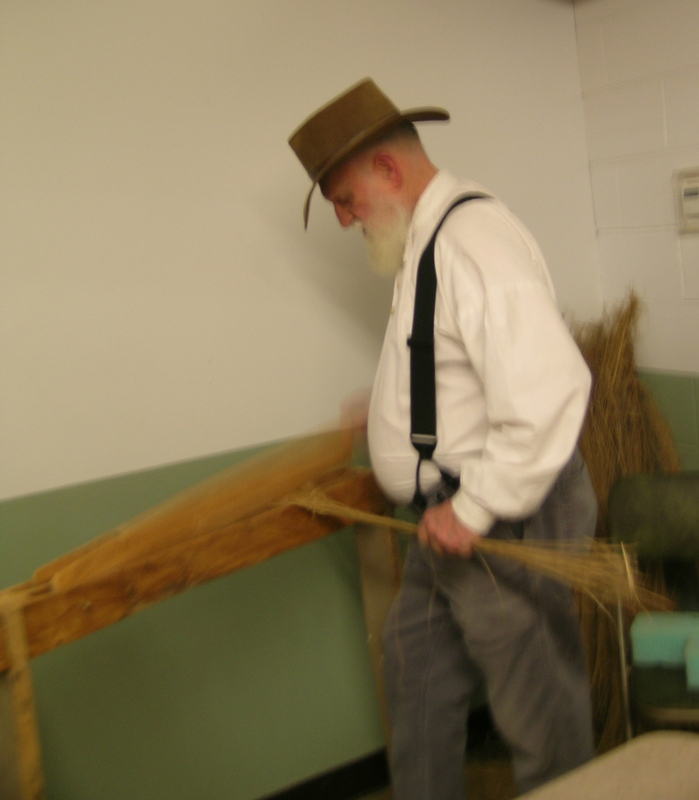 The first three will remove the straw, and the last two will split and polish the fibers. 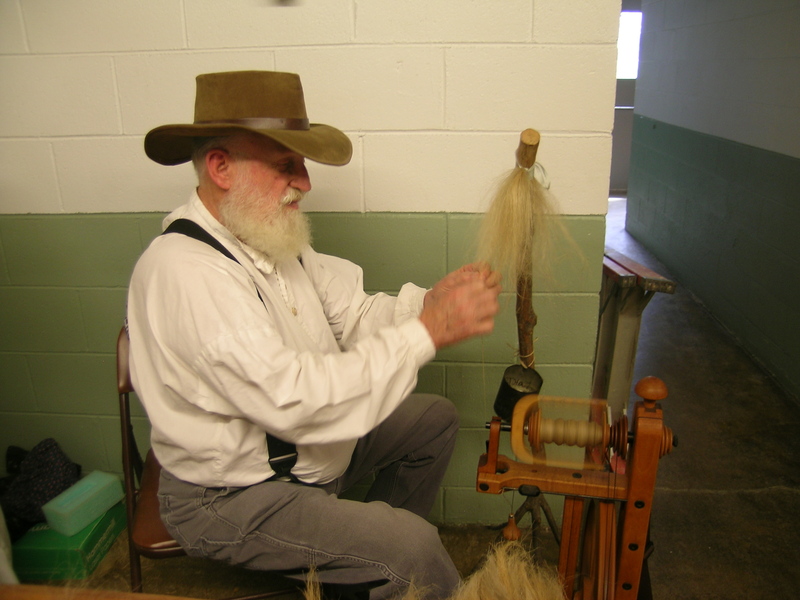 Some of the finer stuff that comes off in the last hackles is called “tow” and can be carded like wool and spun. 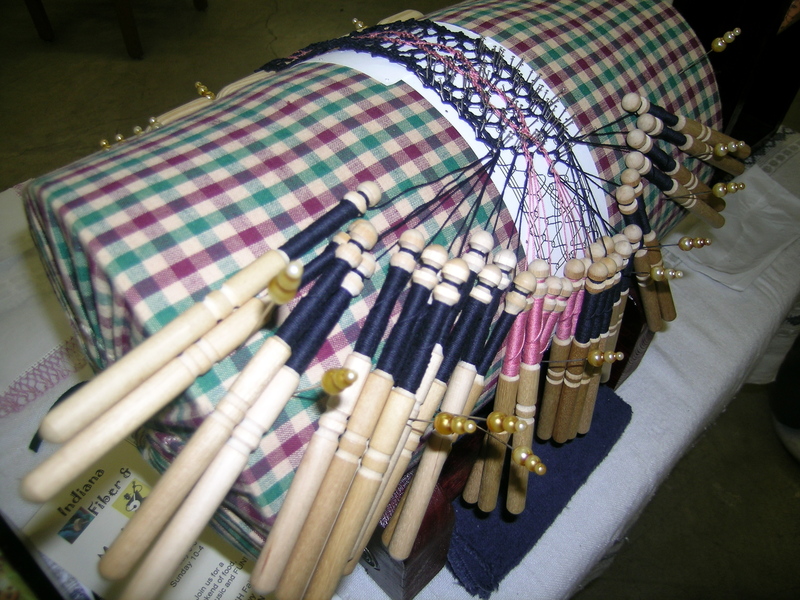 It will produce a coarser yarn than the fibers pulled through the heckles because it will still have some straw in it. 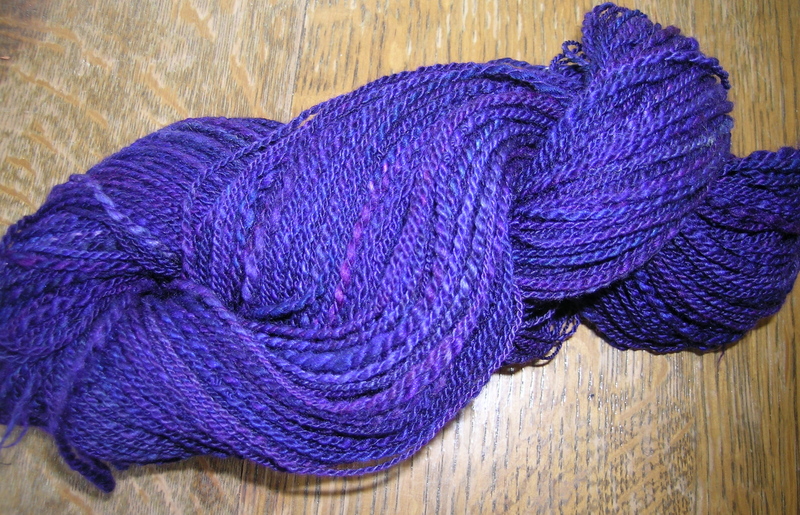 And finally spinning it, and after being spun, it becomes linen. 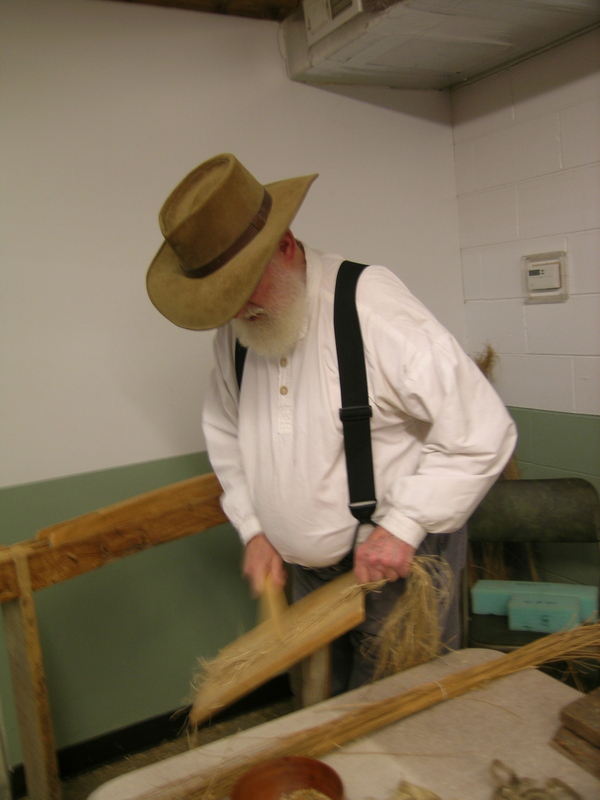 No part of the flax plant is wasted, from animal bedding, fiber for your musket, and seeds which make linseed oil. I will definitely go back next year, and try to encourage more to join me. April 19 & 20, 2013. Did I mention that this is also the covered bridge area? We did not even get to those. Again, a great read, the photos were great and I am green with envy. I collect and LOVE aprons! 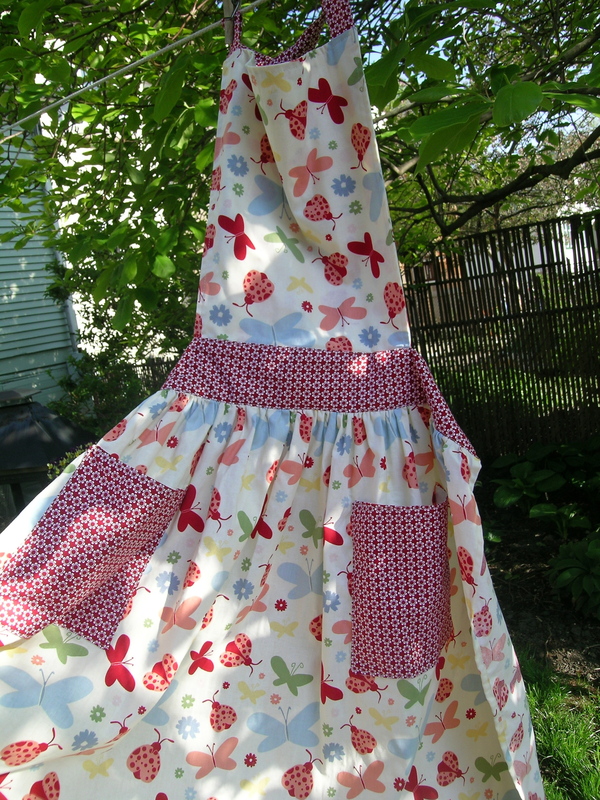 Some of her aprons looked like my grandma’s ! My grandpa was professional baker and I even have his white apron………. they are so much a part of history! Sounds like you had a wonderful time! Thank you for all the wonderful compliments. 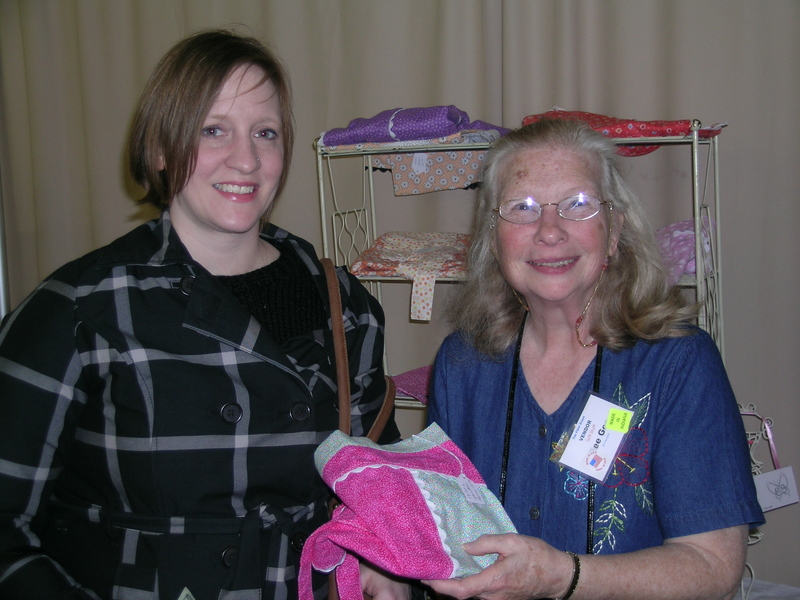 I was also drawn to the apron lady, as my Grandmother always wore an apron. I inherited one of her aprons and it hangs in my pantry, I always think of her when I see it (she was much smaller than I so I cannot wear it). 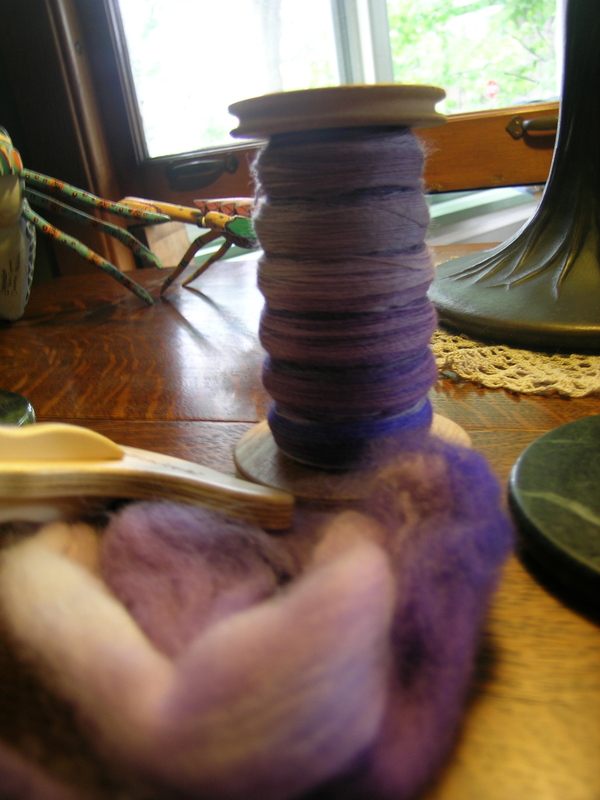 I FINALLY finished spinning and plying the Yak that I had purchased from Fiber Optic Studios. I must say that I felt like a beginning spinner again. I had tremendous difficulty with this fiber, the staple length was so short, and I was constantly breaking my feeder line and having to reconnect. 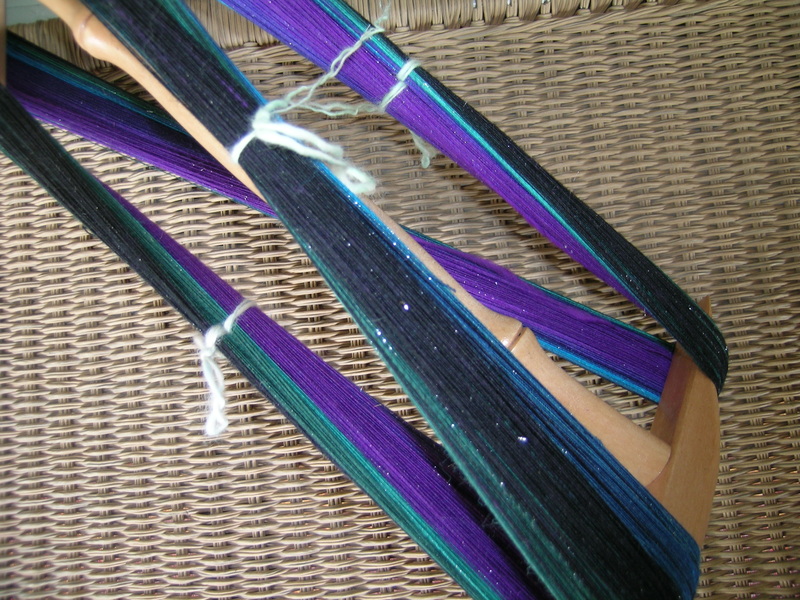 I wasted a lot of this precious fiber (twice the price of a regular braid). I know now that I am a slow learner sometimes, after all of the spinning classes that I have taken, the light bulb finally came on and I realized that I needed to handcard lengths of the fiber and make rolags. This Worked! I no longer had short sections of fiber length, it was all mixed up and pulled its neighbors out nicely. Once I started spinning this way, the rest went smoothly. 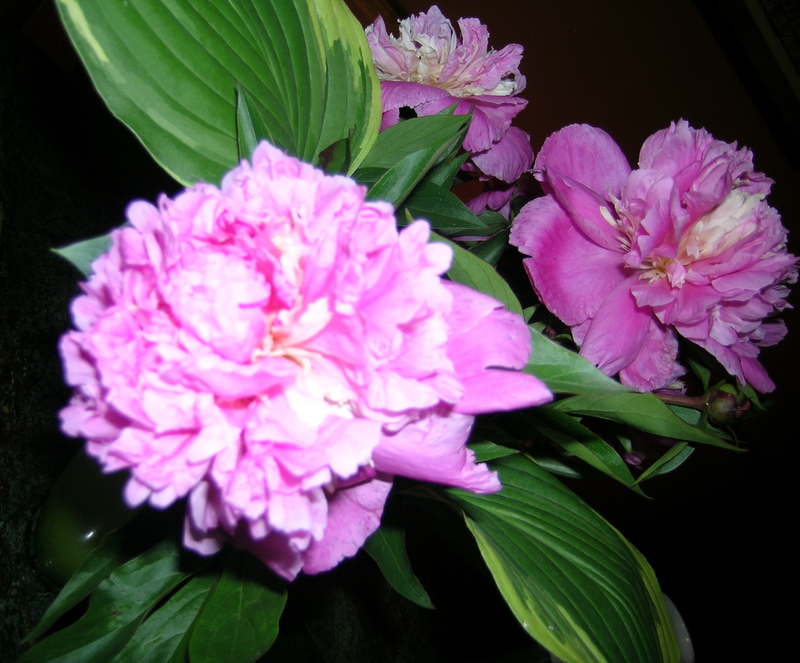 The color is stunning with great depth, and it is very soft. 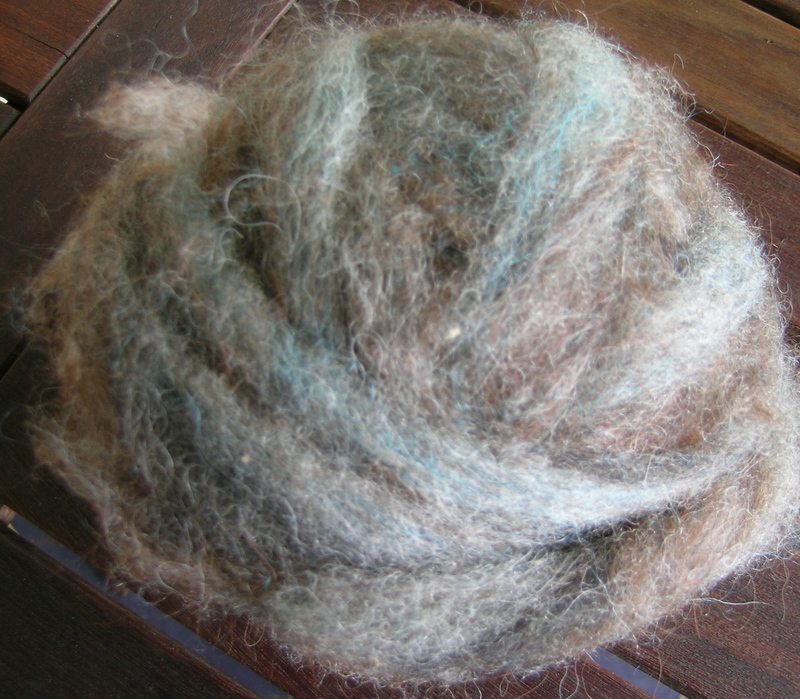 This fiber is destined to knit up into Fair Isle mittens along with some camel that I have yet to spin. 265 yards 2 ply, 40z. 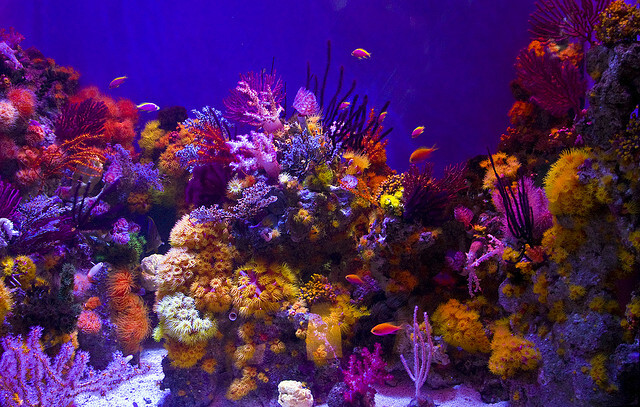 That color is very vibrant. 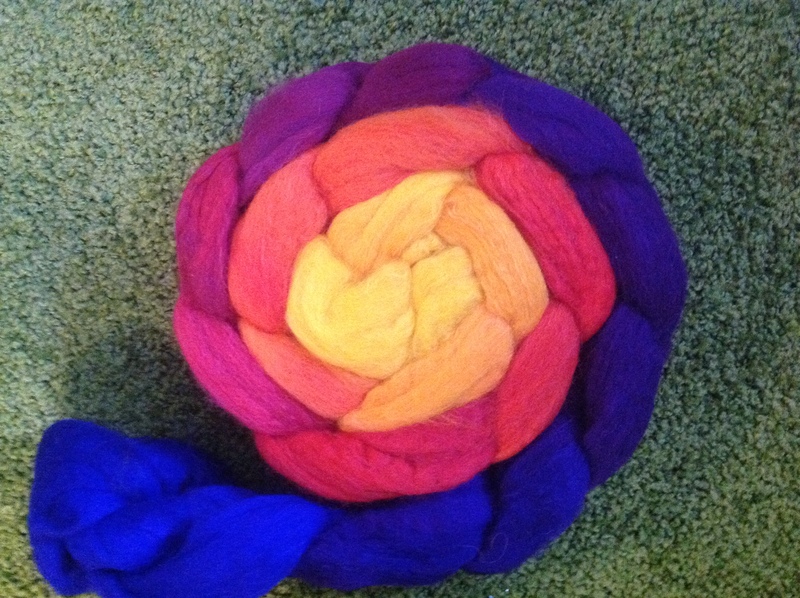 I am new to spinning & love hearing others talk about the various fibers that spin. Talk about making a purse out of a sow’s ear! 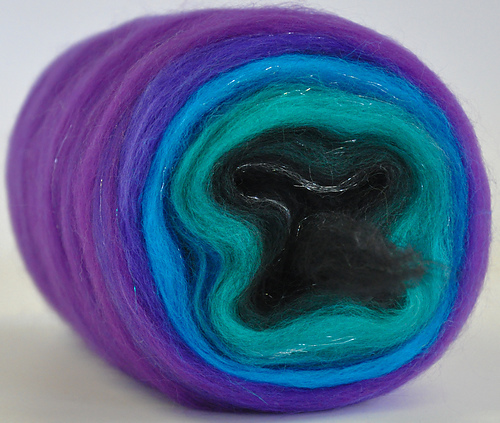 Wow, you preformed a miracle with this roving and I love the color! Show us the final finished work when you have it done! 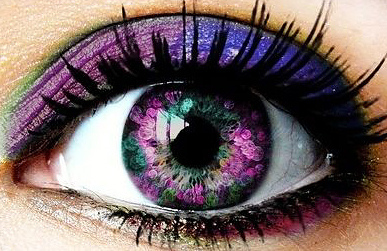 Gorgeous colors–glad you figured out what needed to be done. 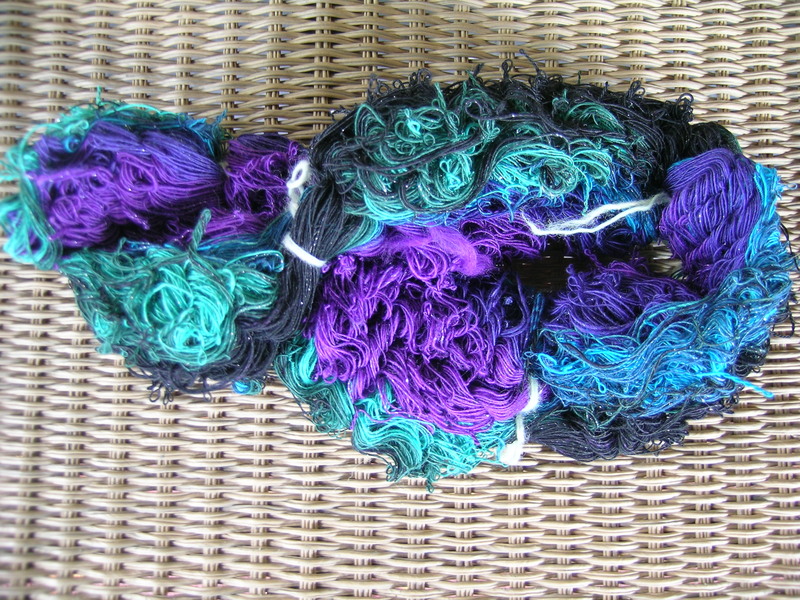 So, when it was plied, the colors are very blended. I love how it came out. And 554 yards!!! Let me repeat that, 554 yards. Enough to make a shawl for myself. I love the colors. There is only one section where I have a blip of larger spun singles. 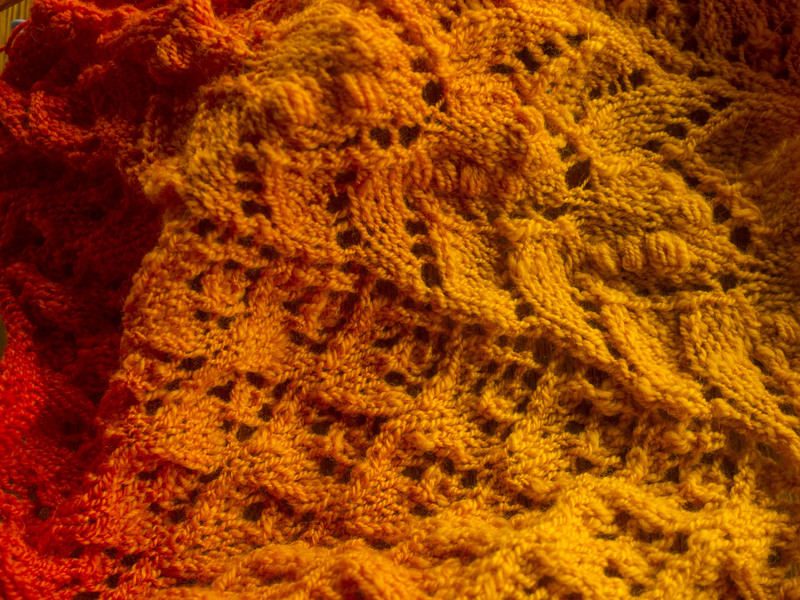 I chose to just leave it in, as I think that it will even out in the knitting, and give it that handspun look. 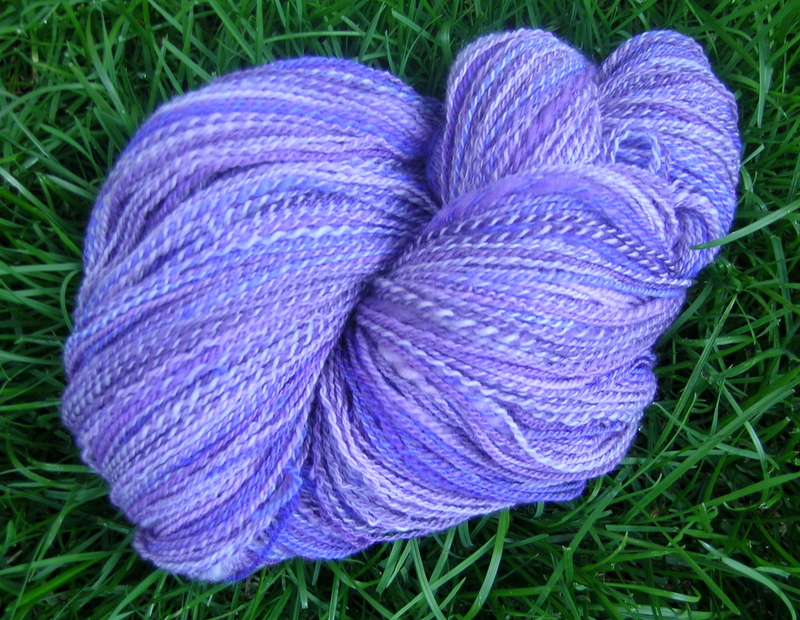 It is also a well-balanced yarn. So awesome! You did such a beautiful job on this. Can’t wait to see what you knit up with it! 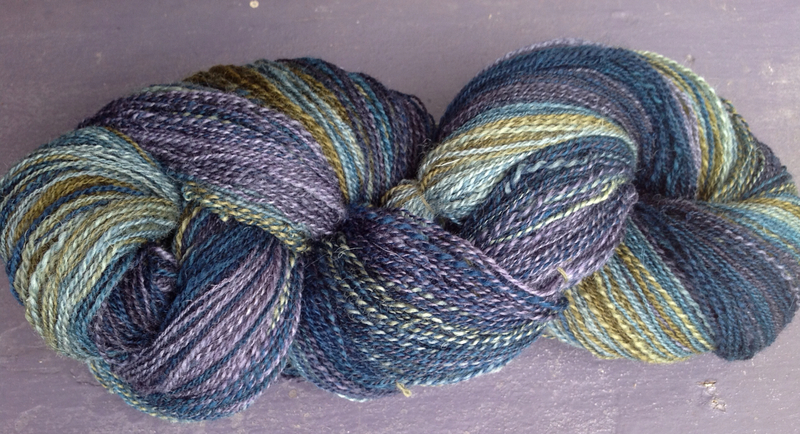 Okay, this is the post where I fess up to my recent Midwest Fiber and Folk purchases. Thank goodness I also don’t have to sneak them in the house, as my husband is a great supporter of my knitting and spinning. 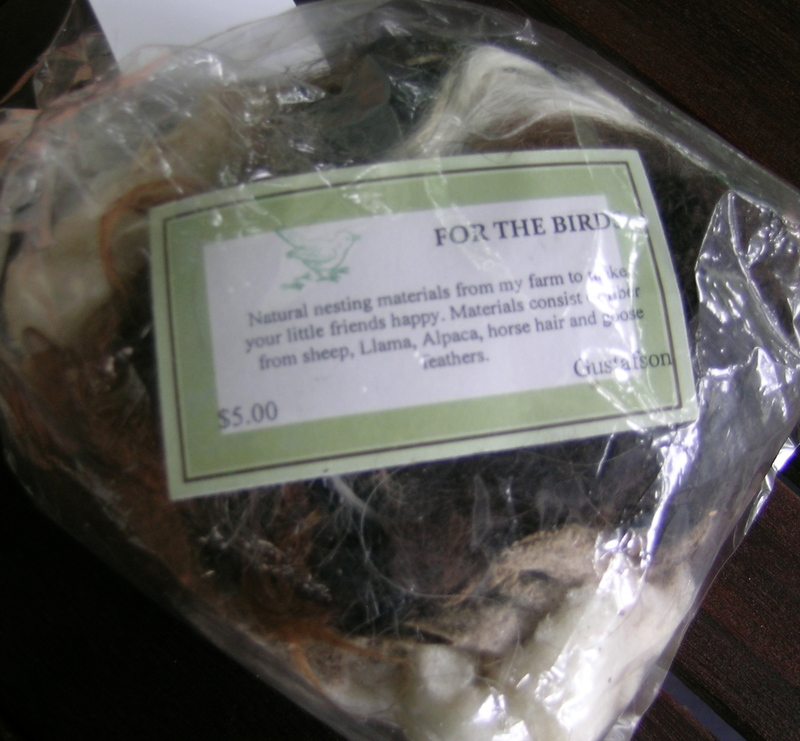 First, something for my husband, the backyard, and the beautiful birds in our Magnolia and Pine trees. A bag of fiber for them also. I need to get a suet feeder to put this in, birds apparently love this concoction. 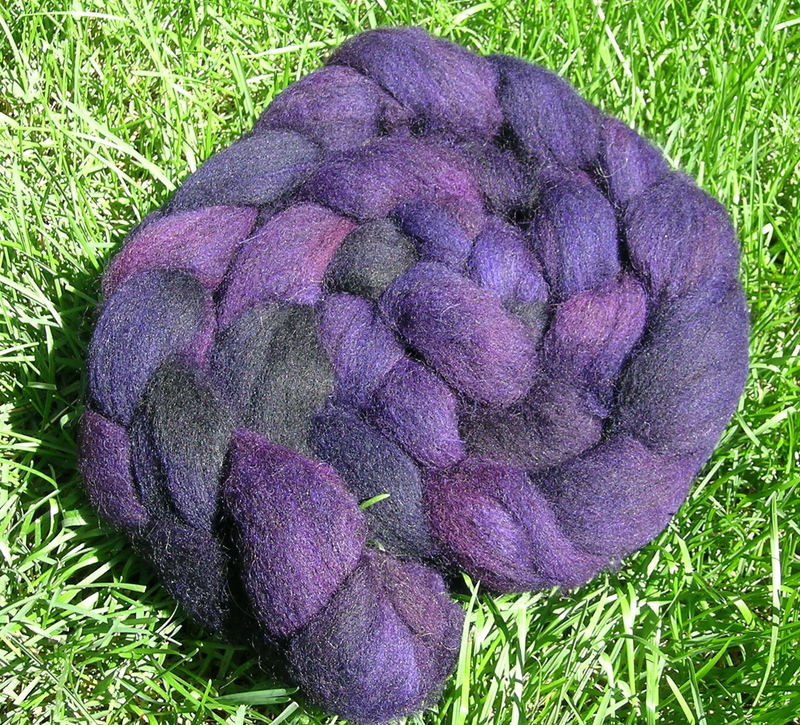 This is a beautiful dyed roving from a young woman, new to this, from Urbana, IL. By the end of the second day, she was sold out of many things, so hopefully she will do well. The thing that I liked about her product was that everything was tested to be reproducible, and you could call her anytime in the future, and she would be able to make more of that color-way. We all know how valuable that would be. 4 oz. 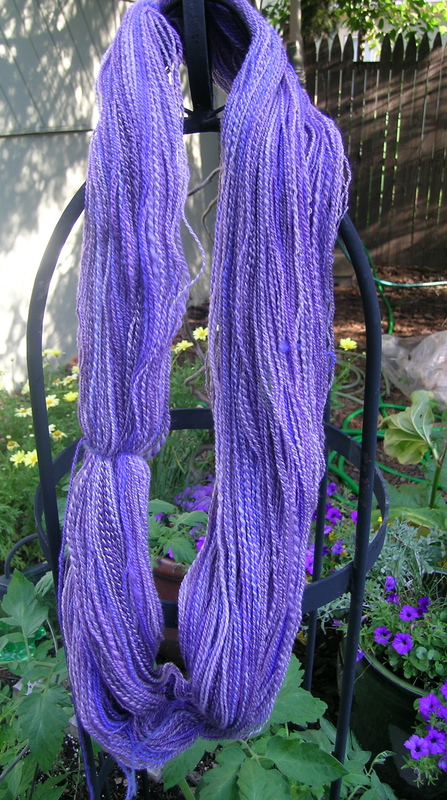 100% Merino, color: Mediterranean. Expertly Dyed is the company. 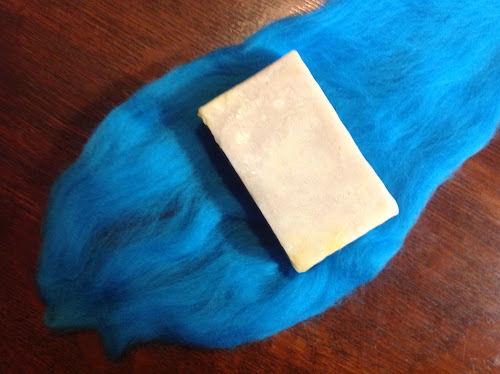 This is 1 ounce each of 2 colors of Llama, with the guard hairs removed, so incredibly soft. From Sugar River Llamas in Lyndon Station, WI. I only bought a small bit to see if I would be able to give it spinning justice. I was drawn to it the first day, and kept returning to pet it, so felt I really needed to sample some first-hand on the spinning wheel. I wish that you could put your hand through the computer and feel how incredibly soft this is. And, if I love it, I can order directly from them. From from the Illinois wool and Fiber Mill, the first is a 4 oz. mix of several leftover fibers, as we would affectionately call it in our house “Swept off the Floor Blend”. 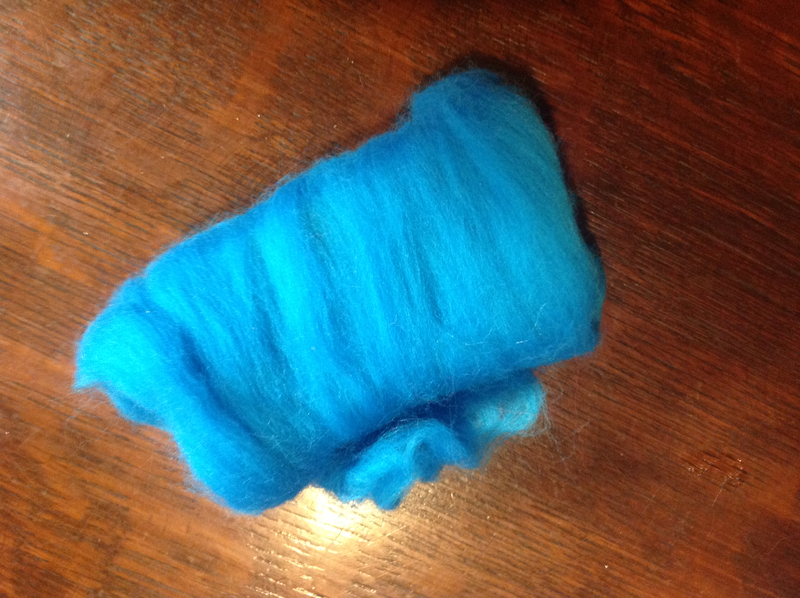 Was cheap, mostly Shetland, and seemed like a good practice fiber. I spoke to the owner of the mill, which is apparently all brand new, and she said that we can take a group up for a tour of the mill, and to see the sheep and lambs. I am looking forward to that. 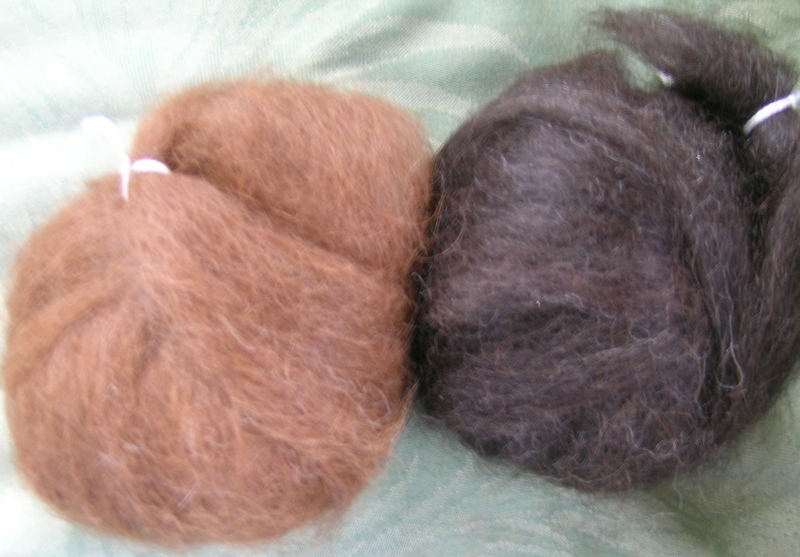 And from the same vendor, some natural Shetland wool for part of the upcoming Breed Studies that I am participating in, and for the Tour de Fleece (more about that later in the week). 4 oz. of the dark fiber, and 2 oz. of the light fiber. And lastly, my Achilles heel at the fair was the booth for Fiber Optics. 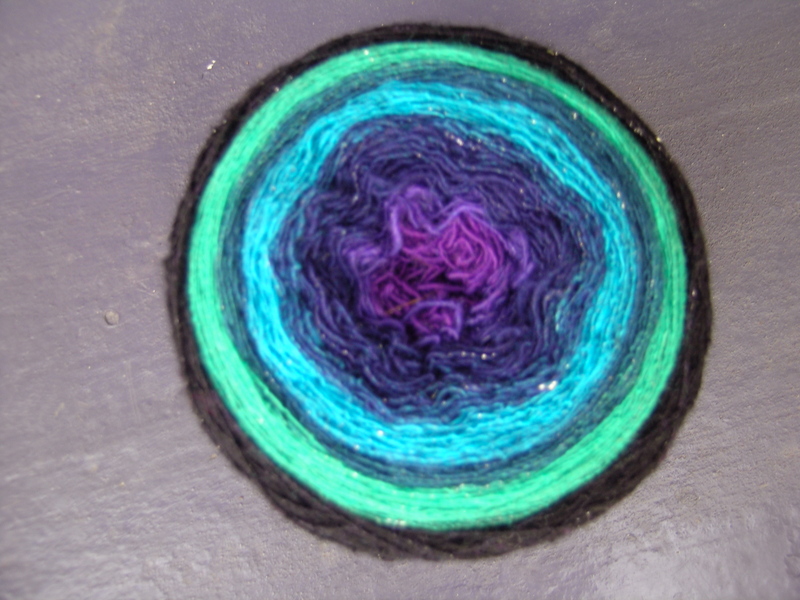 I was in Kimber’s fiber club this past winter, and loved the colors. 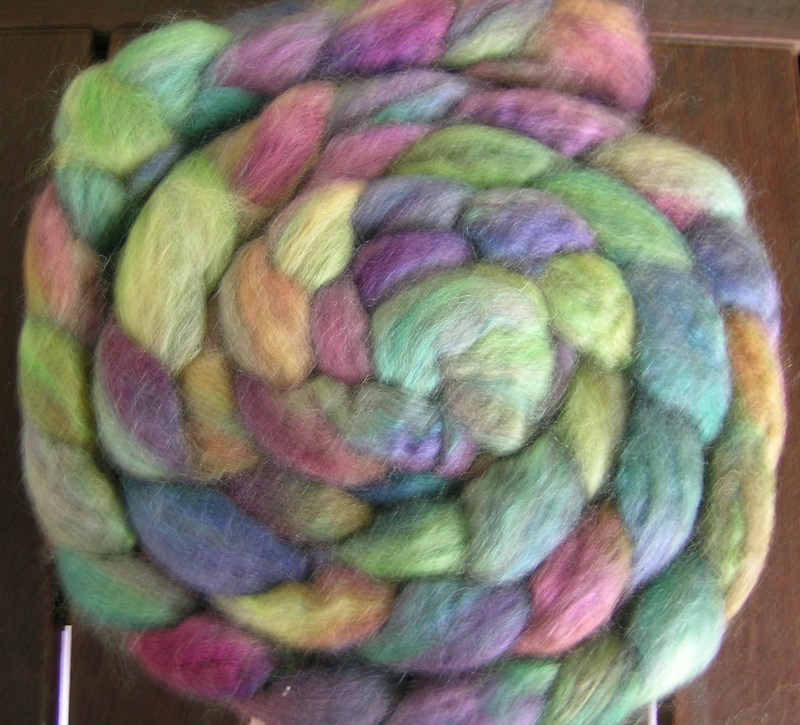 Even though I have many here to spin yet (my spinning is almost “Kimber worthy” in my book), I couldn’t resist. Much of her work is sold out as soon as it is posted, and it is always better to see it first-hand. 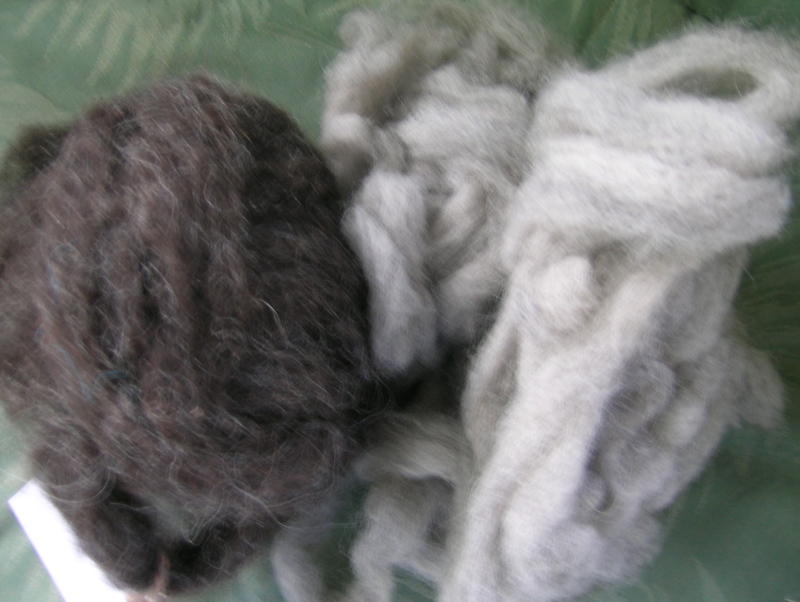 The first is a 100% Shetland, also to be used in the Breed Study and the Tour de Fleece. 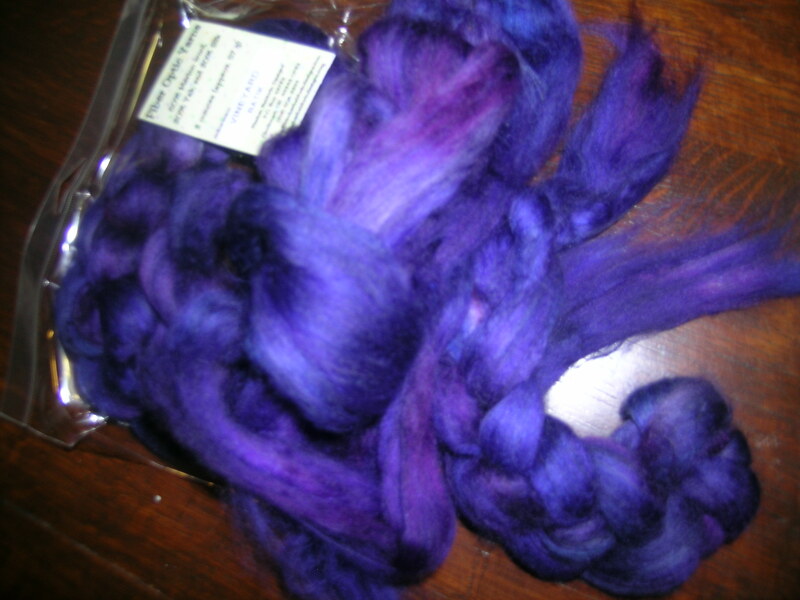 4 oz., color: Aubergine (actually more dark and intense in person, but this was the best I could do with my camera). And then, how could I resist this when seeing it first-hand. 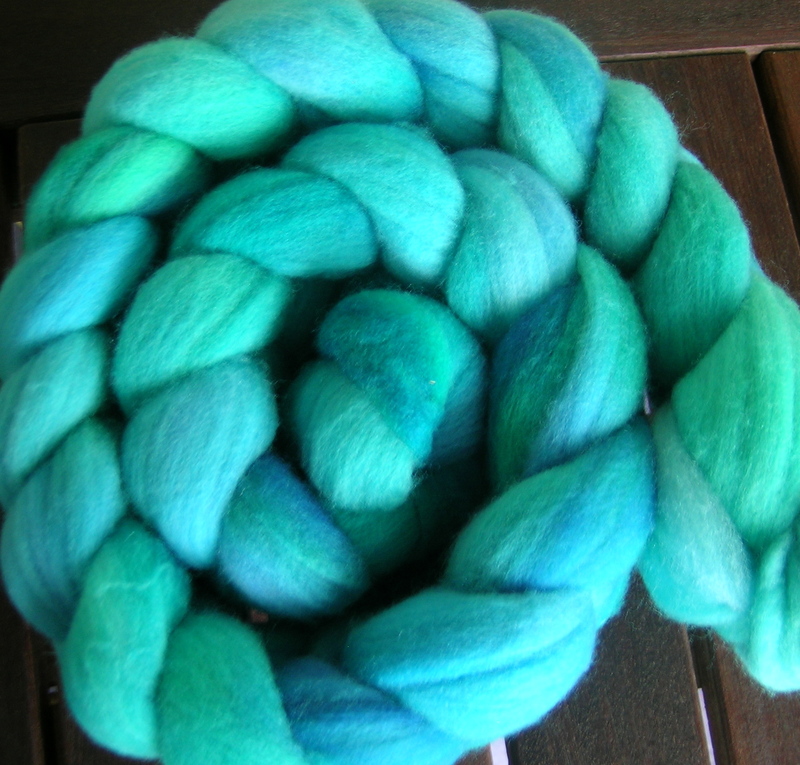 85% BFL and 15% Silk. Color: Mad Monet done with Dye Break (not exactly sure what that means, she is a Chemist and you need to read her own description of the process). Apparently spins up with colors like an impressionist painting. 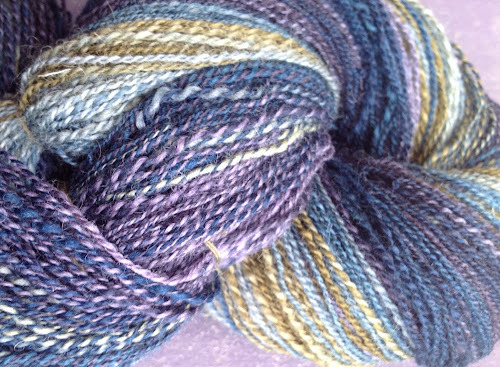 And, lastly after seeing Kimber’s beautiful shawl creation (I forgot to photograph it, but look at her project here), I had to get this gradient fiber, but wanted a different color-way. 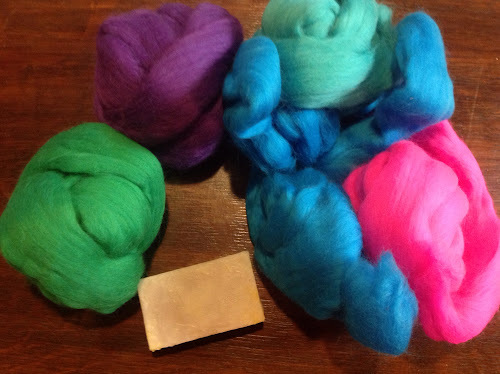 I got 2 packages of this, and am dreaming of a big shawl with softly switching colors.